Let’s go to Lake Caballo for a few days! I clean out the front area of the PTV (Perfect Tow Vehicle) before packing up my new mat, the camp chair, side table, and the crew. I hitch up and make a stop at Walmart for supplies before heading south to Lake Caballo State Park. It’s good to be on the move again. It’s a short trip to Caballo. There’s a campground at the lake and another alongside the Rio Grande. I choose the riverside campground below the dam. It’s a lot different than Elephant Butte State Park. (This is where my ignorance of Southwestern trees and plants annoys me. It limits my ability to describe what it’s like here.) The biggest difference is the number of trees. They grow along the river bank and are scattered across the campground. 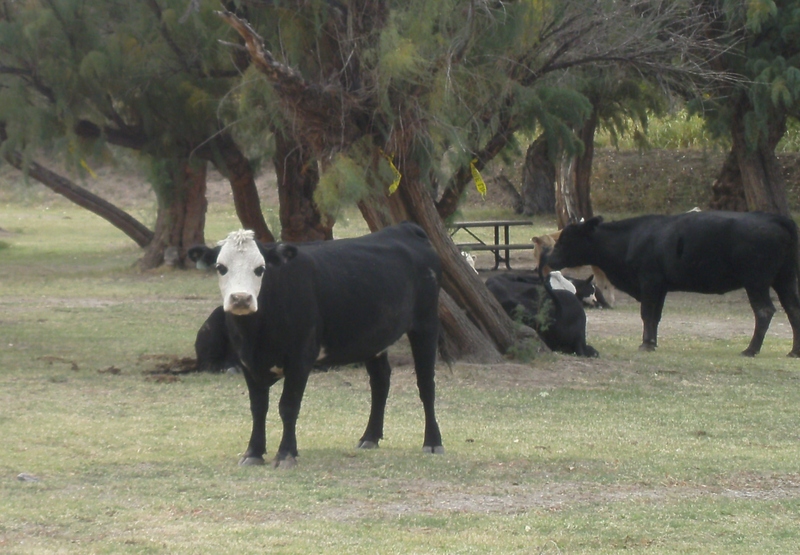 As I circle the campground looking for an electric site, I notice a small herd of cattle . . . in the campground! One cow is near the road and stands staring at us as we drive by. Spike goes crazy, hopping up and down on the bench seat, barking his fool head off. He probably thinks it’s a very large dog as he has no experience with cattle. 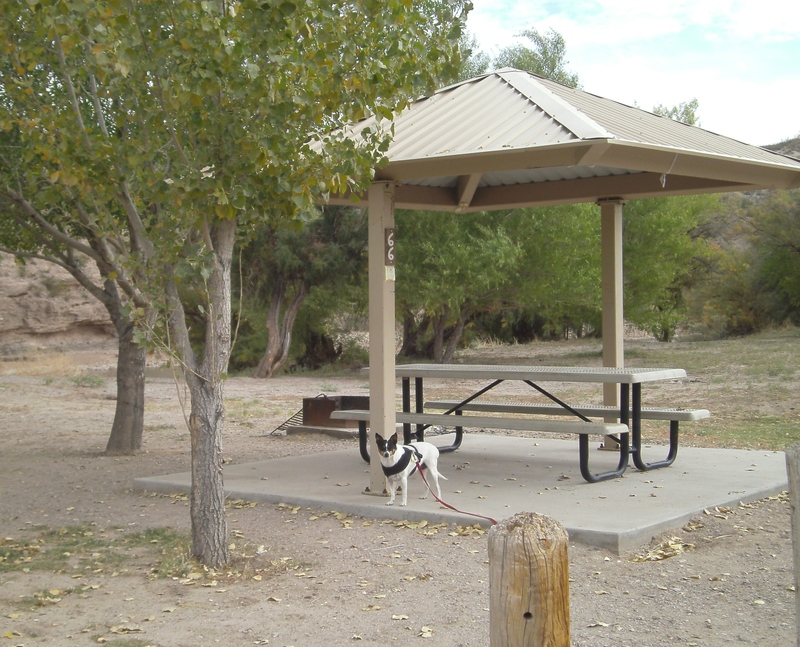 I find a lightly shaded site with a picnic table under a shelter. We have a pretty campsite. The shelter, table, and pen are to the left side of photo. It’s a gravel pull-through which turns out to be close to level. I see there’s a Casita just like mine in the next campsite! The breeze is pleasantly cool as I set up camp. The crew waits impatiently in their pen. I hurry because I know they will erupt into howls and barks if I don’t walk them soon. Not long into our walk, we are greeted by two friendly horses! I want to see the river. There are shelters all along it, as well as plenty of trees, some with massive trunks. Bridget, just before she stages a sit-in. Bridget refuses to go down to the river because I have a camera in my hand. She sits under the shelter and will not budge! She’s played this act before. No one is around this end of the park so Spike and I leave her there. What a pill. The river is low, of course. I wonder if the fishing is good because the fish are concentrated in less area. Some big ones jump. Spike performs his usual ritual and lies down in the water for a bit of relaxation. Back at our campsite, I put the crew in their pen with a water bowl. I sit in my camp chair with a glass of water to relax alongside them. In a few moments along comes a gentleman with a big hello. Joe and his wife, Nancy, are camping in the Casita next door. He’s a retired physicist and his wife is a retired nurse. They reared their children in Pennsylvania and have lived the past ten years or so in Albuquerque. They picked up their Casita at the Rice factory one month before I did. They also chose the same model, a Liberty Deluxe. After chatting for about twenty minutes, Joe runs over to his Casita. He comes back and invites me to their campsite for a stir-fry supper! I move half of the crew’s pen over to their campsite. Spike and Bridget are quiet throughout dinner. I forget all about them as the dinner conversation engages me. I like this camp! I’m looking forward to tomorrow morning when the crew and I will explore the campground further. Thank you for subscribing to rvsue and her canine crew. 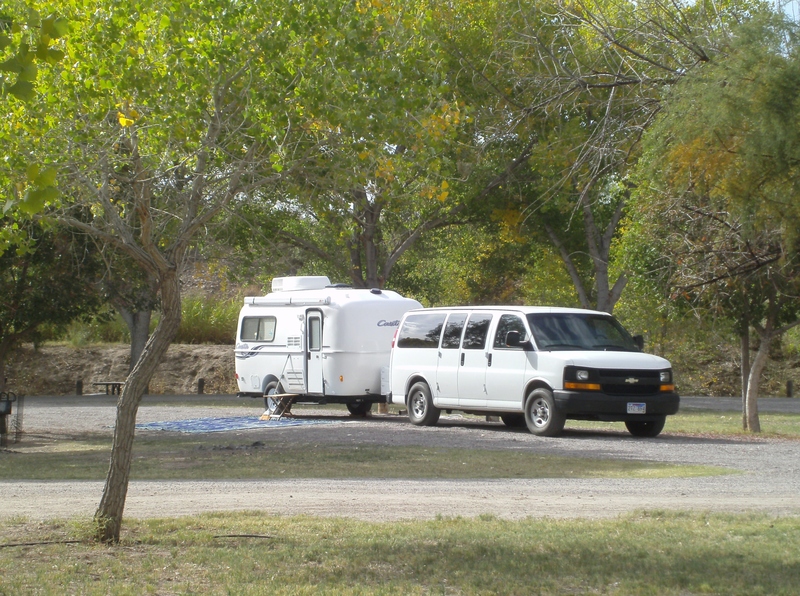 This entry was posted in Simple living and tagged campground, casita, fulltiming, horses, Lake Caballo, New Mexico, Rio Grande. Bookmark the permalink. Do you have the high lift axle? I am wondering what clearance your Casita has between the axle and the ground, and between the lowest part of the body and the ground. I presume that would be the plumbing around the dump valves. I’ve been looking at a trailer with torsion axles like yours, and worry about clearance. Have you had any problems dragging your trailer on washouts and such? I’m wondering how they lift the casita. I have the high lift axle. I don’t think I’ve ever had anything but the tires touch the ground. I think the lowest place on my rig is the tail pipe on the PTV. I’ll check that. Well, what I am doing here is looking at a 23 foot trailer with a pair of torsion axles and trying to compare ride height to the Casita. I am afraid the Rockford is too low for some of the washed out dirt roads I tend to roam down. It is about 9 inches from the ground to the discharge pipe on the black tank. Another useful measurement would be the distance from the middle of the Casita wheel to the back bumper, so I can put some of that high school geometry to work for the first time in ages. Clearance is not something I had to worry about much with the fifth wheel. But I see folks scrape the bottoms of bumper trailers all the time, just going into filling stations. And I have a sharp angle up my driveway. Bob, in the market for the right trailer. I can not answer your question just about Casita as I have a Scamp, but they both use the same style axle. You can get the axle’s setup at different angle’s. They also put spacers in between the frame and axle mounts to raise the trailer. Center of rear wheel to back edge of bumper…..approximately 65 inches. The plumbing is above the frame so it is not the lowest point. Hope that’s helpful. What’s nice is the high lift comes with the big, super-duper tires! Good luck making your purchase . . .
That’s better clearance than the trailer I was looking at. Thanks. I love the pictures of your current campsite ! What are your plans for a campground when it is cold this winter ? Will you head out of state….NM seems too cold….. The electric section of the campground was almost full when I drove in, so I was lucky to get such a pretty site. The crew’s pen is in the shade right next to the picnic table which is ideal. I don’t know what I’m doing for the winter. I’m going to try to stay in NM. I do have visions of driving at breakneck speed trying to keep ahead of a cold front! I’ve been reading your blog now daily for about a month, and have to tell you that it’s one of the best that I follow. I love seeing pictures of your campgrounds, and your stories about Spike and Bridget. I will be starting a life on the road next summer in a newly-purchased (but not new) Pleasure-Way B van, and New Mexico will be the primary destination. 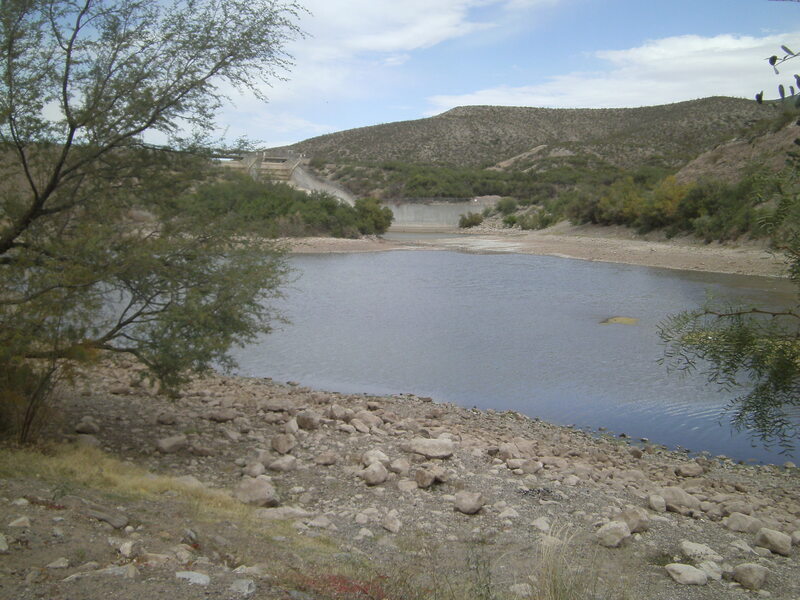 Love your accounts of Elephant Butte and now Caballo. Many thanks to you for blazing the proverbial trail and for telling the tale! Welcome to my blog! I hope you read my entry about the two ladies I met at Coyote Creek Park. They’ve travelled extensively in their Pleasure-Way, and have been very happy with it. Good luck to you! I remember the anticipation building as I waited for summer to arrive so I could get on the road. I’m hardly blazing a trail as there are many, including women alone, who have and are fulltiming. Thanks for the compliments. I love to read them! We are glad you like Caballo Lake State Park! Chuck and I have never visited there! 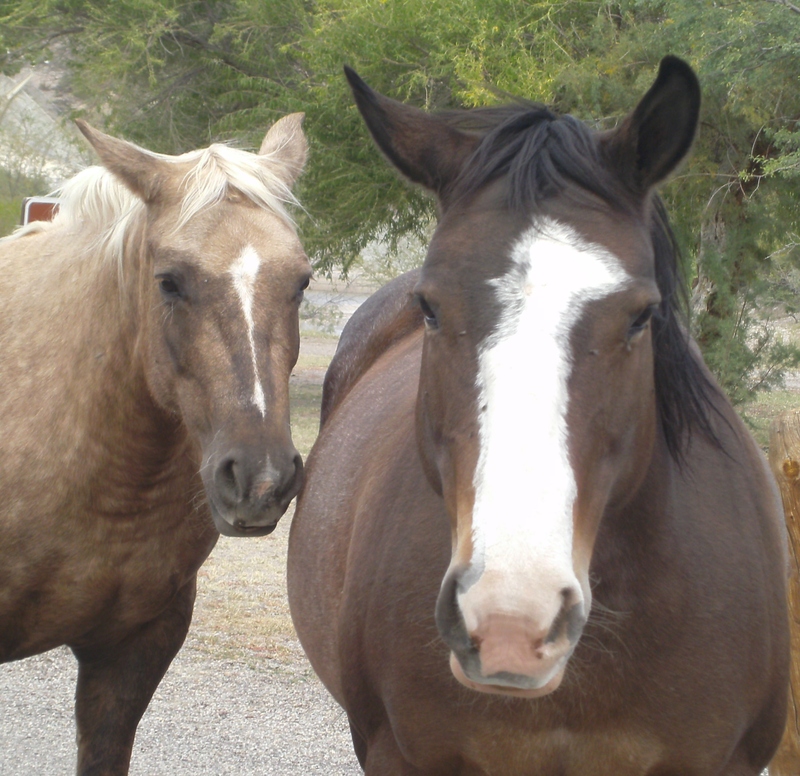 To find curious cows, friendly horses and a Casita next door is amazing! Coming home from Chloride yesterday, we passed a Casita on their way to Chloride!!! Lots of little eggs on the road! So happy sweet Spike has a place to soak his belly! haha! Good photos of Caballo! Thanks for sharing! Hi, Geri! …. Hi, Chuck! Thanks again for inviting me to join you in Chloride and for feeding me while I was there. I enjoyed the afternoon very much. Say hi also to Emily. I guess she’ll be leaving you soon. Happy trails, Emily! I’m sure we’ll meet again wherever the roads take us. Yeah, Spike loves his soak. He’d be in heaven at Riverbend Hot Springs! I’ll be here at Caballo at least until Thursday morning. I’ll probably be back at Elephant Butte Park before long. Hi Sue, ants (etc) tend to cling to the underside of carpets placed on the ground. I suggest you check the underside before stowing. You dont want the PTV infested. PS great blog! Thanks for looking out for the PTV! I have carpet squares I keep for various purposes, like protecting my knees when I kneel down to raise or lower the stabilzer jacks. If I leave them out, after a bit they collect ants underneath, like you said. So far the big, blue patio mat hasn’t drawn any ants. It might be the weave or the polypropylene it’s made out of. As least I haven’t seen any so far . . .
PS Glad you like it!! WOW!!!!!! Wishing for y’all : Smooth?? ?roads, clear BLUE skies & balmy???breezes!!!!!!!!!! Now I know four Southwestern trees . . . the juniper, the screwbean mesquite, and thanks to you . .. the honey mesquite and the cottonwood! I think Casitas are equipped with powerful magnets . . .
Love your new location… we are sure enjoying your travels from place to place, and how much you take the time to enjoy the simple things…. like setting up the pen and sitting with a glass of water. I love reading those kind of details, it gives your blog such a peaceful and relaxing theme! Keep it up!!!! Thanks for the feedback and the compliments. When I reread an entry, I sometimes think . . . now why does anybody need or want to know I sat down with a glass of water! LOL…. Glad you find it relaxing. We have been full-timing in our Casita for a year now. Still sane and haven’t killed each other. We love it. We enjoyed Rockhound State Park near Deming. You take Rte. 26 south of Caballo to Deming. The view at night is spectacular. Enjoy your blog! The crew and I will be at Rockhound SP sometime soon. Two people fulltiming in a Casita . . . you must be the most tolerant people on the planet . . .
Caballo Lake SP is really a trip. When I was there a couple of horses would walk thru my campsite every now and then. They seem to think it was their campsite. I heard a family of racoons had my site before I arrived.